U.S. Patent No. 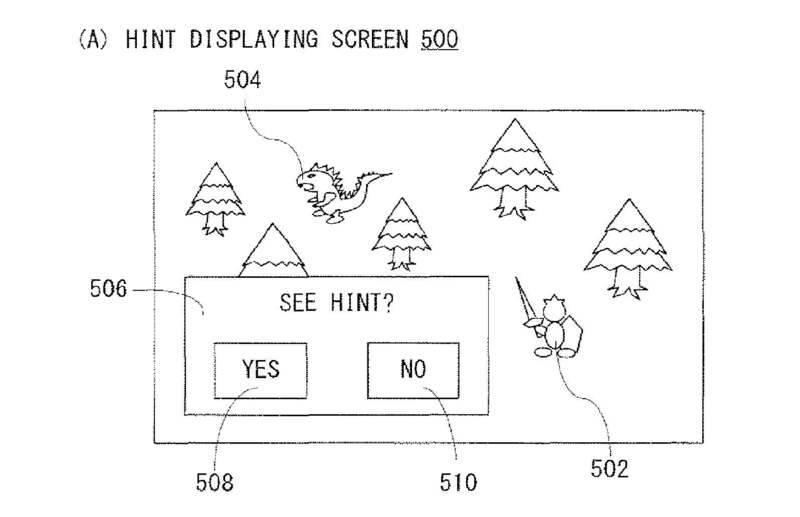 9,687,733 (the ‘733 Patent) describes a video game that utilizes a step counter as a game mechanic. The player needs a device capable of counting steps and transmitting the information to the system or else the player can not utilize their steps. 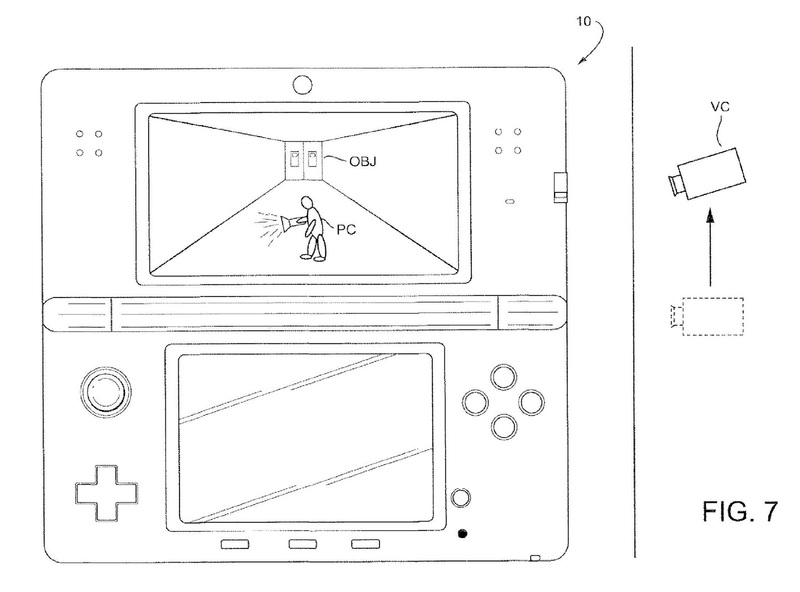 If the player does have the necessary device, then the player’s steps can be used as a means to advance the game. A player can choose how to spend their steps by selecting from a variety of in-game options such as currency, experience points, or even a hint. Unspent steps are utilized to advance supplemental areas of the game, so no step is wasted. 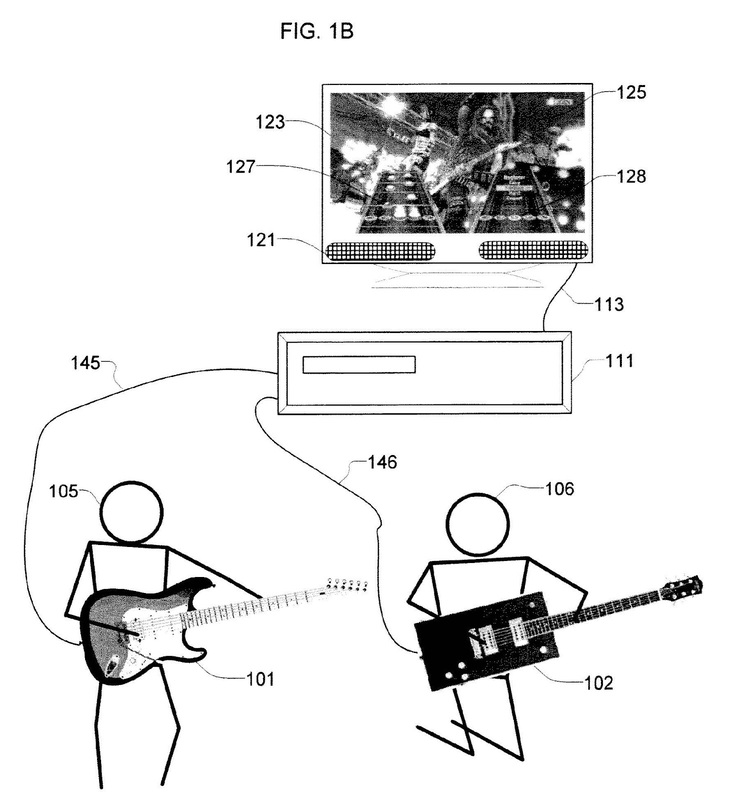 The ‘733 Patent mainly lists a number of ways a player can spend the steps. 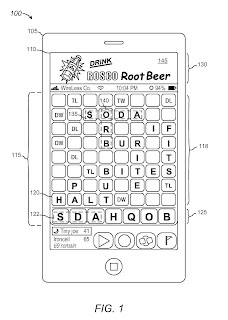 Issued April 24, 1984, to Best, Robert M.
U.S. Patent No. 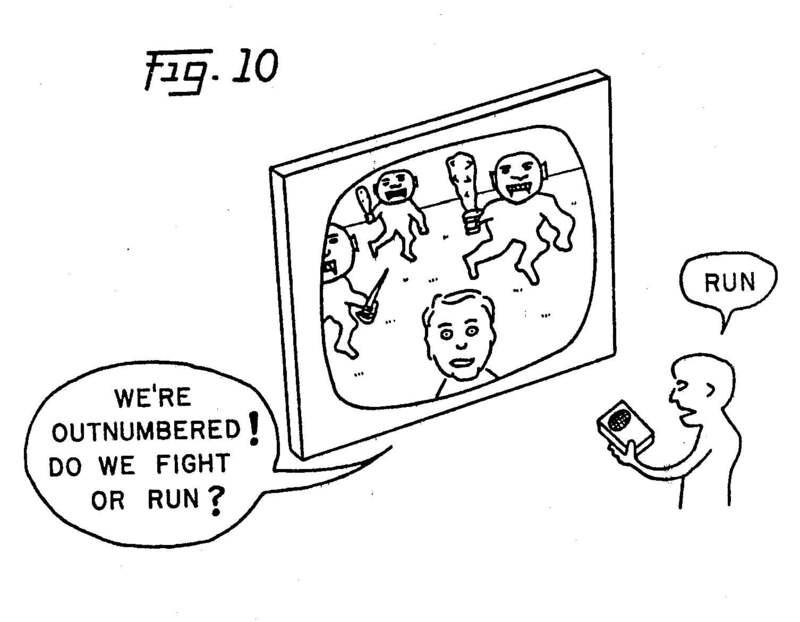 4,445,187 (the ‘187 Patent) describes a video game in which the user can talk to a character in a video game. The ‘187 Patent is a continuation of U.S. Patent No. 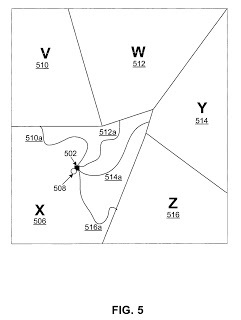 4,305,131 (the ‘131 Patent), titled Dialog between TV movies and human viewers. 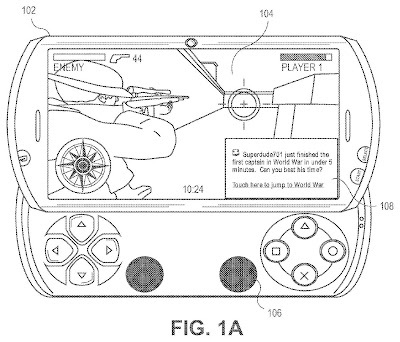 Both patents utilize a hand-held speech-recognition device so the user can interact with the characters on screen. 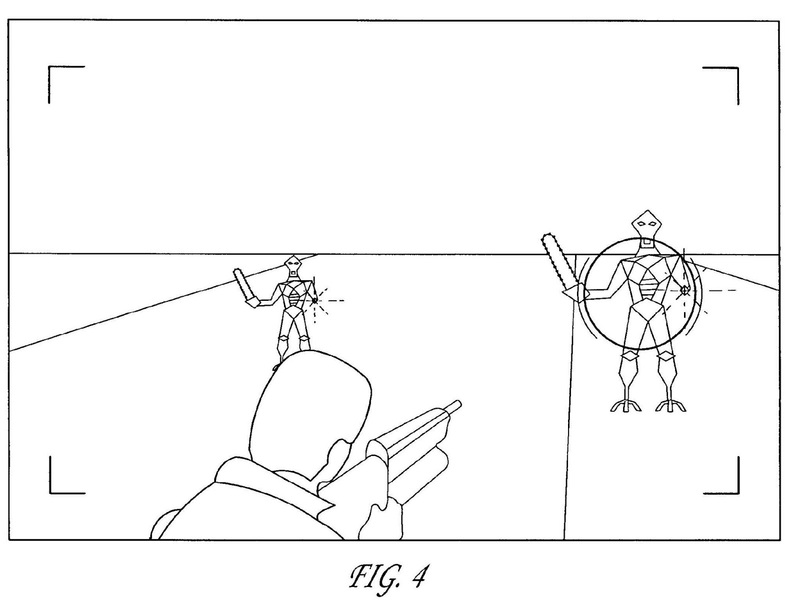 A major difference between the two patents is the ‘187 Patent relates to game characters or cartoon characters whereas the ‘187 only relates to human actors. 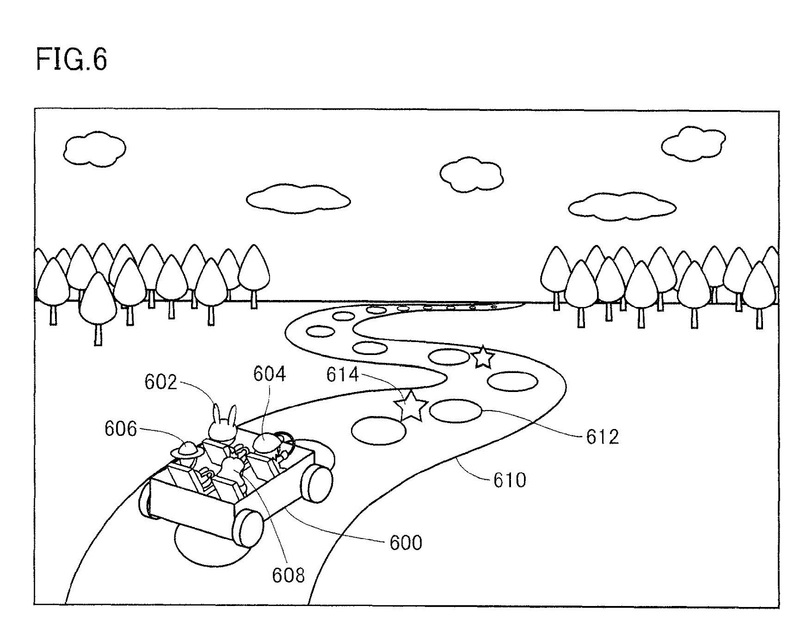 The game described in the ‘187 Patent has branching storylines. A player will be presented with an option at a given point in the game. Both possibilities link to different storylines saved in the game data. A player will encounter different dialogue and different scenarios based on which option was chosen. The player makes his choice by giving a verbal answer into the speech-recognition device. The hand-held device would display a menu with prompt words. A player could also ask the game character a question or make a side comment by pressing a button on the hand-held. 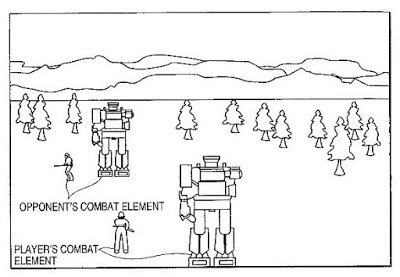 The system would listen for select words to determine how the game character should respond. The game also allowed for multiplayer, but each player needed a hand-held unit so that they could each receive a different prompt. A video game system by which human viewers conduct simulated voice conversations with game characters or cartoon characters in a branching story game shown on a television screen. The characters and cartoons reply responsively with lip-sync sound to words input by viewers. Different audio and video frames are generated from data memory and video disc to provide one of several alternative replies or alternative actions at each branch point in the game, depending on which words are selected by the viewer. A menu of prompting words is displayed to inform viewers of what words they can use at each branch point. Viewers can input questions or make other remarks by pressing a button next to one of the displayed sentences which causes a recording of the displayed sentence to be played or speech synthesized in lieu of a viewer speaking it. Viewers can chat with simulated images of famous people, call the plays in a ball game, make executive decisions as a king or general, and participate in simulated adventures with interesting game characters who respond to each viewer’s words and answer back responsively. 1. A video apparatus for simulating a voice conversation between a human viewer of the apparatus and a talking video character, the apparatus comprising: first means for reading video frames from a record carrier means to provide a first video frame sequence associated with a plurality of alternative second video frame sequences; second means for reading video frames from a record carrier means to provide access to at least one of said alternative second video frame sequences before the end of said first video frame sequence; means for displaying said first and second video frame sequences including a simulated image of said talking character accompanied by corresponding voice sounds, thereby providing one side of a simulated voice conversation; means for communicating to said human viewer during said first video frame sequence a plurality of alternative verbal responses corresponding to said alternative second video frame sequences; means for receiving from said human viewer a response signal corresponding to a selected verbal response in said plurality of alternative verbal responses, thereby selecting a corresponding [second] video frame sequence; means for generating voice sounds electronically including words in said selected verbal response, thereby simulating the viewer’s side of the voice conversation; and means for switching at the end of said first video frame sequence between the video frames from said first reading means to the video frames from said second reading means to provide said selected second video frame sequence accompanied by voice sounds corresponding to said selected second video frame sequence, thereby simulating a voice conversation between the talking character and the human viewer. Issued November 11, 2014, to Microsoft Corp.
Real-time strategy games allow the player to command an army against imposing forces in real time. The player builds his army at the same time his opponent. The classic example of a real-time strategy game is StarCraft. Every movement in a real-time strategy game is crucial because time is a factor; wasteful motion can be the difference between winning and losing. Because time is such a factor, PC has dominated the real-time genre due to the flexibility and quickness of a mouse and keyboard offer. Traditionally, the cursor and screen position moved independently of each other. Early attempts at bringing real-time strategy kept the tradition control scheme, but cursor’s movement speed on a console could not match the quickness of a PC mouse. U.S. Patent No. 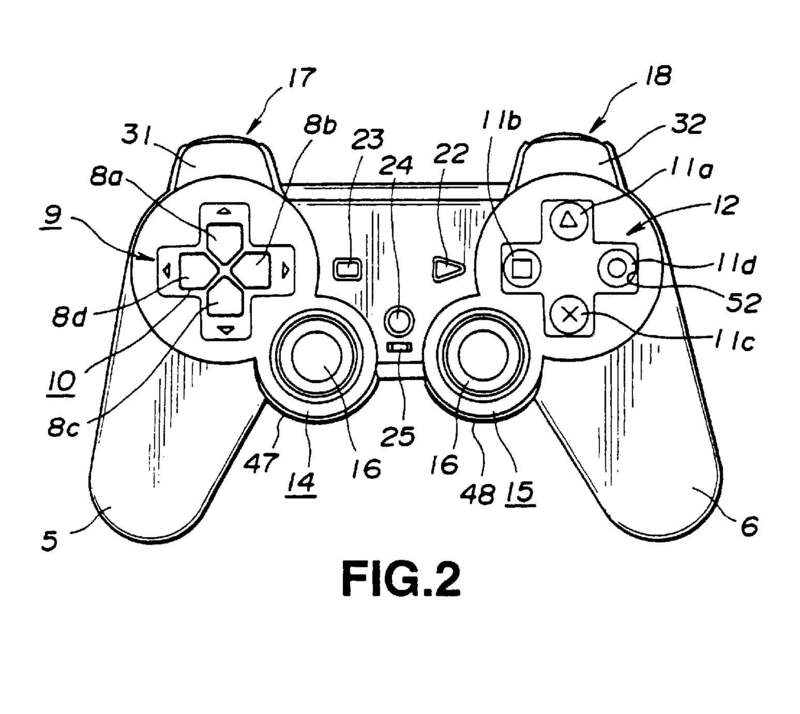 8,882,594 (the ‘594 Patent) describes a control scheme for a real-time strategy game on a console that locks the cursor to a fix position in the center of the screen. When the player moves the cursor, the screen position also moves. The cursor always stayed in the center of the screen even if the player tilted the camera. By bolting the cursor to the center and moving the screen position instead, players could move and select units at a quicker pace. 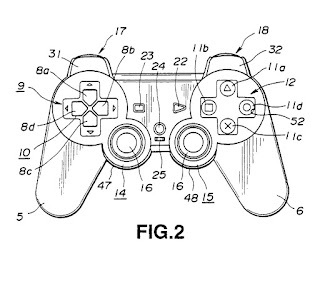 Also, the control scheme allowed for players to switch between different units using certain buttons. Microsoft used the ‘594 Patent’s control scheme in the Halo Wars franchise. A control scheme for a real time strategy game using a game controller includes maintaining a cursor in a known, fixed position of the monitor in a manner so that it appears the game space if moving behind a cursor even during changing viewing positions such as tilting movements. 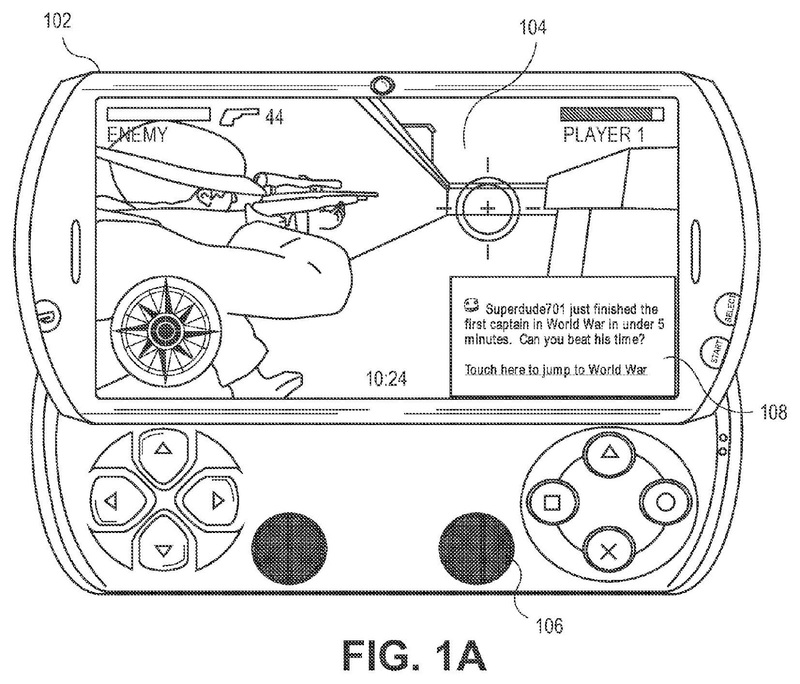 The control scheme further includes other aspects including a technique for selecting units using the game controller and interacting with menus using the game controller. 18. A system comprising: a processor; an input device having a user activated button; a rendering device; and a computer readable storage medium having instructions accessible by the processor and which when executed on the processor conduct a real time strategy game based on user input from the input device, the instructions comprising: operating a plurality of units of a plurality of different unit types in a game space, each of the units taking action in the game space based on corresponding instructions; determining a first user position relative to at least some units in the game space, the first user position being spaced apart from the units and having a parameter indicative of a first tilt with respect to the units; rendering a first view of a portion of the game space on the rendering device based on the first user position, the first view not corresponding to a view as seen by any of the units in the game space, the first view having the first tilt and including a cursor for selecting a unit, the cursor being at a known position relative to an edge of the rendered first view; receiving an indication of activation of the input device and, in response, identifying a set of the units based on the unit types; determining a second user position, with the processor, based on the identified set of the units, the second user position being spaced apart from the units and having a parameter indicative of a second tilt with respect to the units that is different than the first tilt; and for at least some of the execution of the game, rendering a second view of a portion of the game space based on the second user position, the second view having the second tilt and showing the identified set of units, while maintaining the cursor in the known position relative to the edge of the rendered view, the second view not corresponding to a view as seen by any of the units in the game space. U.S. Patent No. 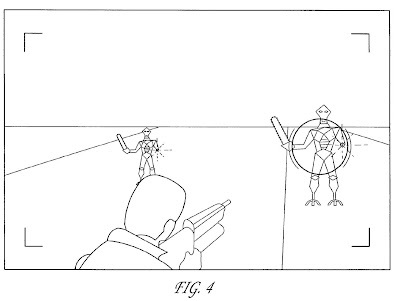 9,266,022 (the ‘022 Patent) describes a method to pause a game due to the player physically entering into a danger zone. Motion control video games often require players to move physically. 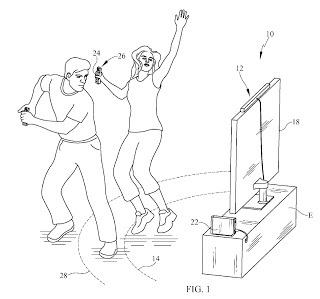 Physically moving can become a problem when the player does not realize where he/she is in relation to other objects, like the television. It is possible that a player does not realize he/she has moved closer to the television due to being intensely focused on the game. 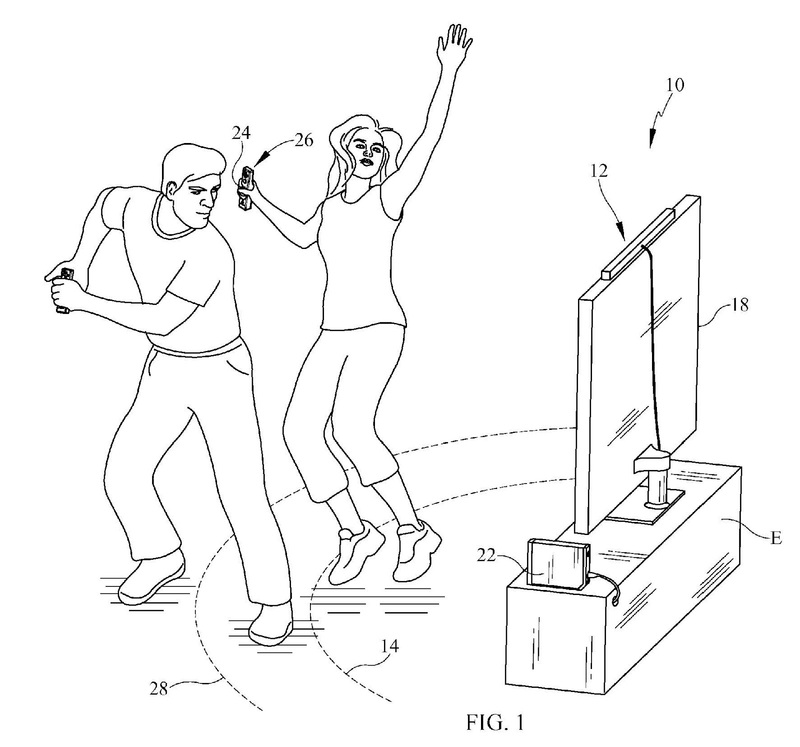 The ‘022 describes a method to warn players before crashing into the television by creating several exclusion zones using a console’s motion sensors. The first zone is a warning zone, so when a player enters into it, a warning is displayed telling the player he/she is getting too close. If the player ignores the warning and enters the second zone, the system pauses the game. The game will resume after a set amount of time or if the player manually resumes. A system for use in an interactive gaming console system wherein the gaming console system uses a sensor monitor to detect player actions, wherein either the sensor monitor’s motion and proximity sensors or dedicated motion and proximity sensors detect whenever an object enters an exclusion zone, which is the area wherein the object is too close to the sensor monitor. If an object is detected within the exclusion zone, then the game being played by the gaming system is paused at the point of played and resumed after a set or settable time delay or after a manual resume command is issued by user in the usual way. A warning zone can also be defined just beyond the exclusion zone so that a warning signal of appropriate type can be issued to warn a player that the player is approaching the exclusion zone allowing the player to back away from the exclusion zone. 1. An interactive gaming system, for use by at least one player, the interactive gaming system comprising: a gaming control unit running a software routine that runs a game and displays the game being run on an output device, the software routine capable of being paused at a point within the game, and thereafter resumed from the point; a forward direction looking sensor monitor determines motion of an object and a proximity of the object from the sensor monitor in the forward direction, the sensor monitor in communication with the gaming control unit such that the gaming control unit receives input signals gathered from the sensor monitor and uses the input signals to control the software routine such that if the sensor monitor senses that a moving object is in the forward direction and is closer to the sensor monitor than a first threshold distance, the gaming control unit issues a threshold pause and pauses the software routine and wherein the gaming control unit issues a perceptible warning if the sensor monitor senses that a moving object is in the forward direction and at a proximity distance greater than the first threshold distance and less than a second threshold distance; and wherein the first threshold distance is variable and wherein the gaming control unit automatically resumes running of the software routine after a set amount of time has elapsed and the sensor monitor no longer determines that a moving object is closer to the sensor monitor than the first threshold distance in the forward direction and wherein the gaming control unit has an accumulator that calculates the number of times the threshold is exceeded during a set time interval and if the number of times calculates exceeds a threshold number, the software routine pauses the software routine until a set code is communicated to the gaming control unit. Issued October 7 2014, to Nintendo Co., Ltd.
U.S. Patent No. 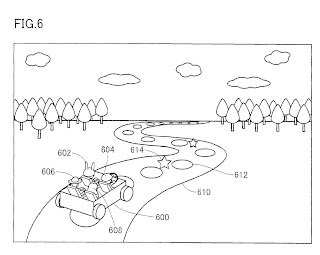 8,851,993 (the ‘993 Patent) describes a board game video game where all the players travel along the same path together. Normally, every player in a board game travels an independent route. Each player will roll a dice that determines how far an individual player travels. Depending on the game, the route may have forks in the road where a player can choose which direction to travel. 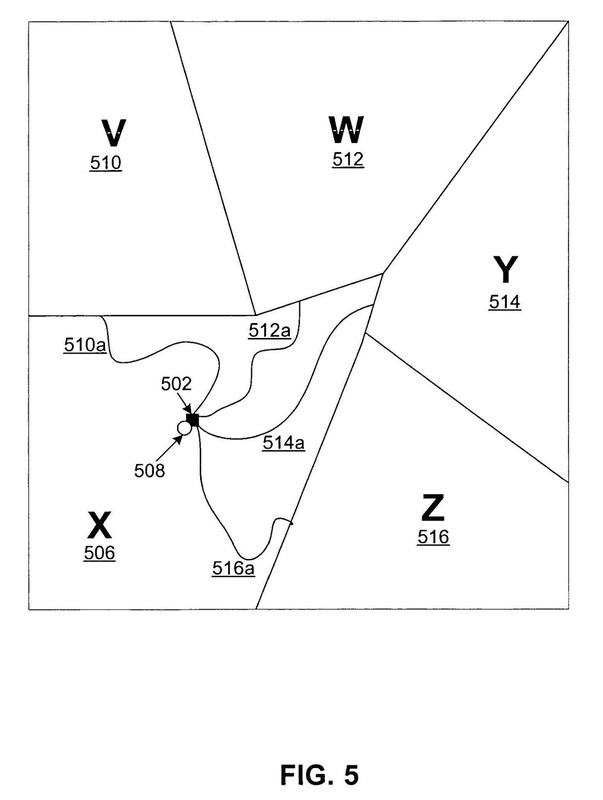 The ‘993 Patent describes a board game where each player travels together. Each player will get to roll dice but the distance traveled will be applied to the group. If the group lands on a special square, then the player who rolled the dice will receive the benefit or determent of the square. Some squares will apply to the group as a whole. 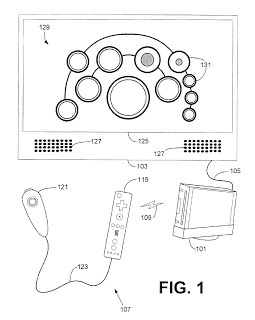 Nintendo has used the board game described in the ‘993 Patent in several Mario Party games. An exemplary embodiment provides a game device. 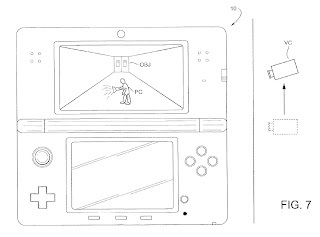 The game device includes an indication acceptance unit for accepting an indication for determining an amount of movement, a movement amount determination unit for determining an amount of movement on the prescribed route, a position updating unit for updating positions of all player characters on the route in accordance with the determined amount of movement, and an event processing unit for executing an event on the player character and the indication acceptance unit includes a normal indication acceptance unit for accepting a normal indication for determining a normal amount of movement and a special indication acceptance unit for accepting a special indication for determining an amount of movement different from normal, which is executed alternative to the normal indication and of which number of permitted times of issuance by the plurality of player characters is limited. 1. A device for playing a game in which a plurality of player characters move on a prescribed route in a game space displayed on a display, comprising: an information processing device including one or more processing units configured to perform functions and operates as: an indication acceptance unit that accepts a movement indication for determining an amount of player character movement on said prescribed route directed to a player character among said plurality of player characters; a movement amount determination unit that determines an amount of player character movement on said prescribed route when said indication acceptance unit accepts the movement indication; a position updating unit that updates positions of said player character for which the movement indication has been accepted and of all other player characters on said prescribed route in accordance with said amount of player character movement determined by said movement amount determination unit; an item acquirement/loss processing unit that performs processing by which player characters acquire or lose a prescribed item in accordance with an update of a position of said player character for which said movement indication has been accepted; an event processing unit that executes an event at least on said player character for which the movement indication has been accepted in accordance with the position to which said player character has been moved; and a win/loss processing unit that performs a win/loss determination in which winning and losing is determined for player characters based on an amount of said prescribed items acquired by each of said plurality of player characters; wherein said indication acceptance unit further operates as: a normal movement indication determiner that accepts a normal movement indication for determining an amount of player character movement of a type that is a normal movement for a player character in the game, wherein said normal movement indication corresponds to a value of a cast shown by using a normal die, and a special movement indication determiner that accepts a special movement indication for determining an amount of player character special movement which is of a type that is different from said type that is a normal movement for a player character in the game, the special movement indication being used as an alternative to said normal movement indication and for which a number of permitted times of usage by each of said plurality of player characters is limited, and wherein said special movement indication corresponds to a value of a cast shown by using a special die different from said normal die. 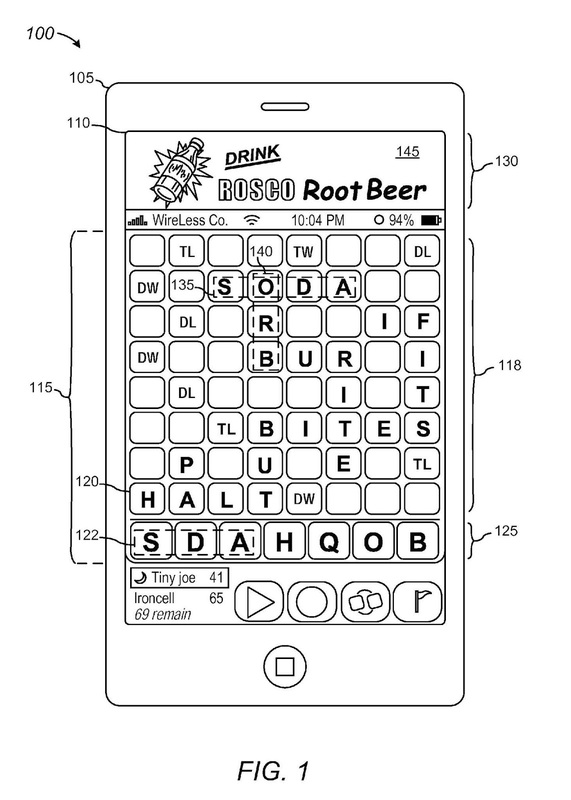 Issued September 2, 2014, to Kabam Inc.
U.S. Patent No. 8,821,260 describes a system and method for granting in-game bonuses to a player connected to in-game items or other in-game features. For example, equipping a magic hat will give the player’s character +3 Magic bonus. Often, a player’s character will outgrow an item as their character levels up. 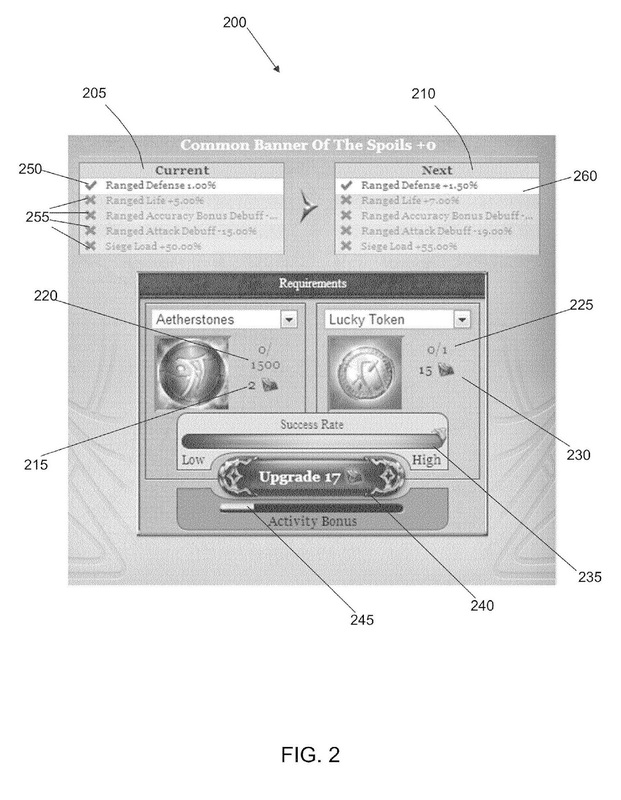 The ‘260 Patent allows for players to upgrade an item to enhance the bonus. However, a failed upgrade could break the item which would decrease the bonus. 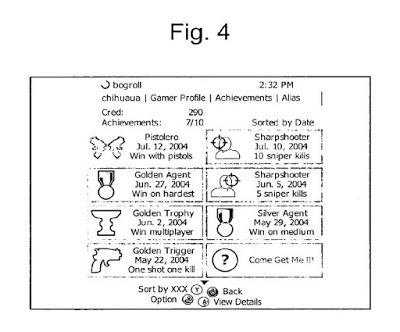 Disclosed herein is technology for providing in-game bonuses to a user’s in-game persona. 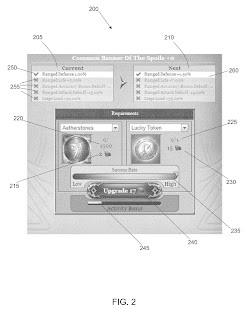 The technology involves virtual items that provide quality-based bonuses and level based bonuses. The technology provides systems and methods for upgrading an item’s level and enhancing the item’s quality. If an upgrade or enhancement is unsuccessful, the item may be broken and the quality bonuses and level bonuses may be decreased until the item is repaired. 1. 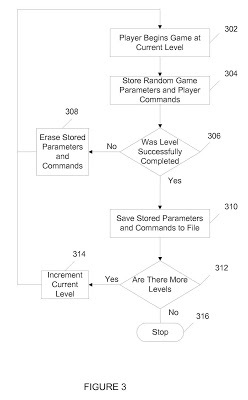 A method, executed on a computer processor, for granting bonuses to a user’s in-game persona, the method comprising: defining an interface that allows a user to place a first virtual item in a first slot within the interface, the virtual item comprising a first quality value and a first level value; receiving input by the user to place the first virtual item in the first slot; establishing, responsive to reception of the input, a set of one or more quality bonuses based on the first quality value; establishing, responsive to reception of the input, a level bonus for each of the one or more quality bonuses based on the first level value; causing the interface to offer the user the ability to upgrade the first virtual item; assigning a percentage likelihood of the first virtual item being upgraded; causing the interface to present an indication of the percentage likelihood of the first virtual item being upgraded; causing the interface to offer the user the ability to increase the percentage likelihood of the first virtual item being upgraded by providing a second virtual item; causing the interface to present an indication of the increased percentage likelihood of the first virtual item being upgraded in response to the user providing a second virtual item; determining, responsive to an acceptance of the offer, whether the first virtual item is upgraded or broken; increasing the level bonus for each of the one or more quality bonuses responsive to the first virtual item being upgraded; decreasing each of the one or more quality bonuses and the level bonus for each of the one or more quality bonuses responsive to the first virtual item being broken; and providing each of the one or more quality bonuses and the level bonus for each of the one or more quality bonuses to the user’s in-game persona. Issued April 25, 1972, to Lockheed Sanders Inc.
U.S. Patent No. 3,659,285 (the ‘285 Patent) relates to U.S. Patent No. 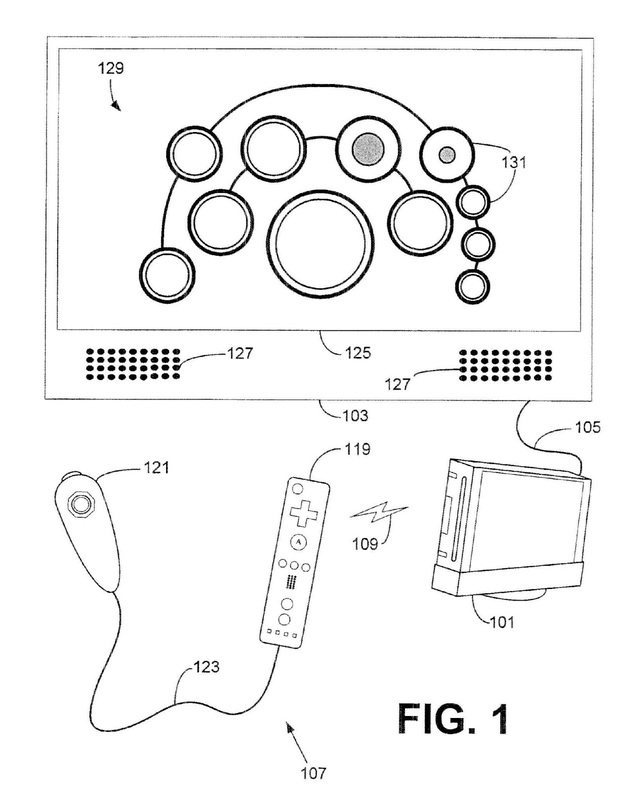 3,728,480, titled Television gaming and training apparatus. 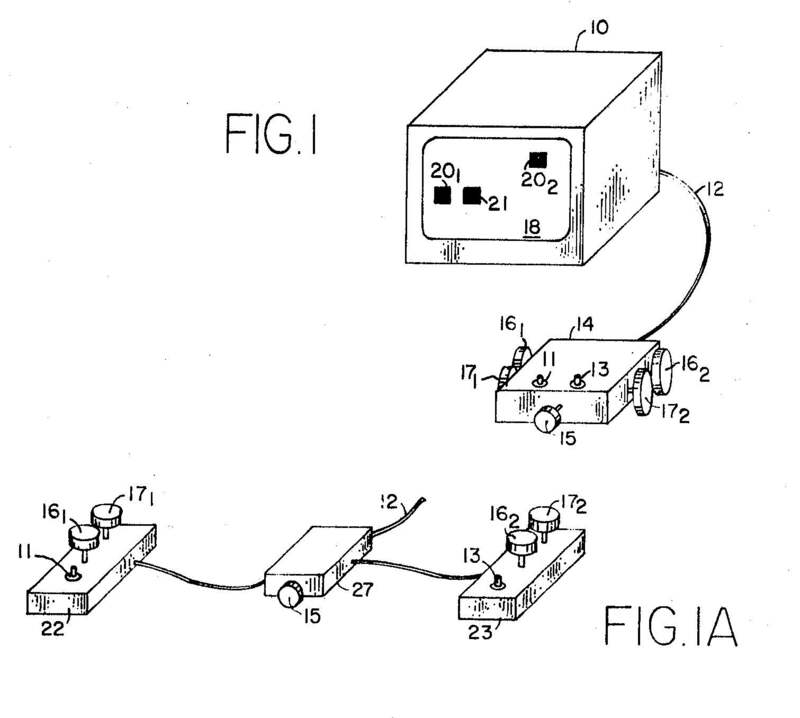 Both patents are connected to the Magnavox Odyssey, the first commercial home video game console. 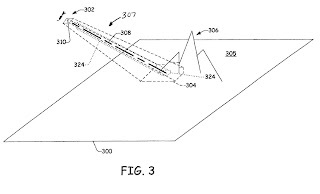 The ‘285 Patent describes a method for providing visual feedback to the players. 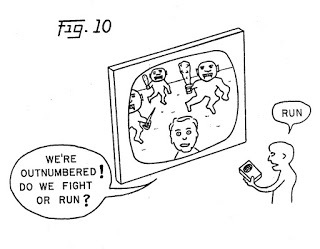 The television generates two types of symbols: a “HIT” dot and “HITTING” dot. “HITTING” dots are the players while the “HIT” dot is the ball. The “HITTING” dots move on a vertical axis on the sides of the screen, while the “HIT” dot moves on a horizontal axis in-between the two “HITTING” dots. “HITTING” dots can change the direction of the “HIT” dot by touching the “HIT” dot. 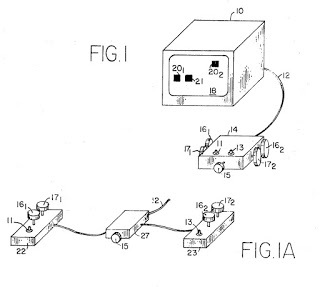 The ‘285 Patent describes a type of game that would later be called Pong by Atari. Magnavox would sue Atari for infringement, but the case settled when Magnavox granted Atari a license. The ‘285 Patent also describes a target shooting game as well. Target symbols are generated and move across the screen like a shooting gallery. Players use a light gun controller to shoot the target symbols. The symbols would reverse direction when hit, but disappear off screen if missed. Apparatus and methods are herein disclosed for use in conjunction with standard monochrome and color television receivers, for the generation, display and manipulation of symbols upon the screen of the television receivers for the purpose of playing games, training simulation and for engaging in other activities by one or more participants. The invention comprises in one embodiment a control unit, connecting means and in some applications a television screen overlay mask utilized in conjunction with a standard television receiver. The control unit includes the control means, switches and electronic circuitry for the generation, manipulation and control of video signals representing symbols which are to be displayed on the television screen. The symbols are generated by voltage controlled delay of pulses and coincidence gating. The connecting means couples the video signals to the receiver antenna terminals thereby using existing electronic circuits within the receiver to process and display the signals. An overlay mask which may be removably attached to the television screen may determine the nature of the game to be played. Control units may be provided for each of the participants. Alternatively, games may be carried out in conjunction with background and other pictorial information originated in the television receiver by commercial TV, closedcircuit TV or a CATV station. 7. Apparatus for playing handball type games by displaying and manipulating symbols on the screen of a cathode ray tube, comprising: means for generating a first ””hitting”” dot; means for generating a ””second”” hitting dot; means for generating a ””hit”” dot; means for generating a wall symbol; means for changing the vertical position of said first ””hitting”” dot; means for changing the vertical position of said second ””hitting”” dot; means for causing said hit dot to move off-screen away from said wall dot when coincidence is not made between eight of said ””hitting”” dots and said ””hit”” dot; means for changing said off-screen position; means for denoting coincidence between said first ””hitting”” dot and said ””hit”” dot; means for denoting coincidence between said second ””hitting”” dot and said ””hit”” dot; means for causing said ””hit”” dot to change horizontal direction upon coincidence between said ””hit”” dot and either of said ””hitting”” dots; means for denoting coincidence between said ””hit”” dot and said wall symbol; means for causing said ””hit”” dot to change horizontal direction upon coincidence between said ””hit”” dot and said wall symbol; and means for displaying said dots upon the screen of said cathode ray tube. 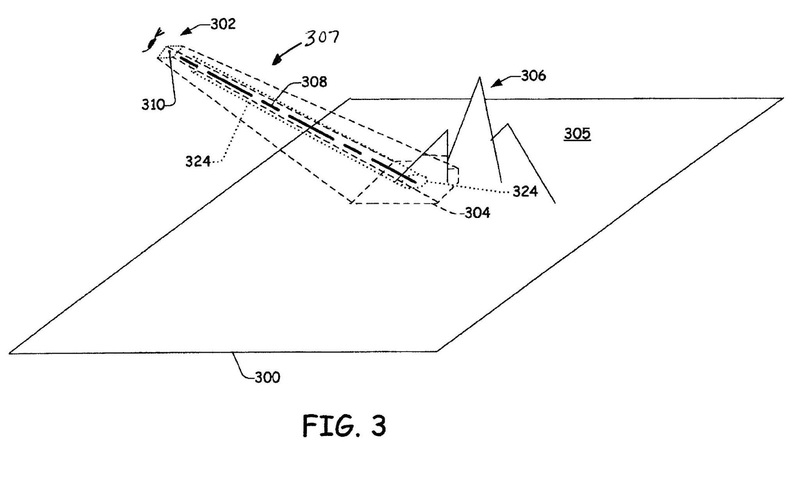 Issued June 2, 2015, to Zynga, Inc.
U.S. Patent No. 9,044,680 (the ‘680 Patent) describes a method for two players to interact in certain online games. 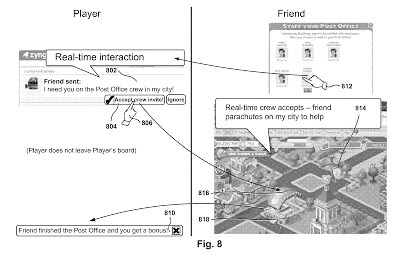 The type of game depicted in the patent is a city building game that could be found on Facebook or the Apple App Store. The ‘680 Patent specifically relates to the ability to invite friends to help progress the game. A friend can help complete a building or generate income depending on the task assigned to the friend. Both players need to be playing the game for the invitation to be sent. A player accepting the invitation will obtain an in-game reward for helping. Methods, systems, and computer programs are presented for executing an online game. One method includes an operation for executing a first game board for a first user and a second game board for a second user. The first game board is created when the first user plays the game for the first time and the second game board is created when the second user plays the game for the first time. 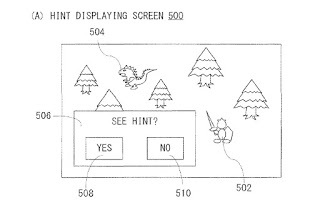 The method further includes operations for detecting a visit by the second user to the first game board, and for detecting a request by the second user to place a game asset in the first game board. The game asset is installed in the first game board when the first user approves the request, and the second user obtains one or more game rewards when the first user interacts with the game asset while playing the online game. 1. A method for processing game operations during execution of an online game, the method comprising: executing, by a game server, a first game board for a first user and a second game board for a second user, wherein the first game board is created when the first user plays the online game for a first time and the second game board is created when the second user plays the online game for a first time; establishing, by a live interaction server, a synchronous mode of play when the first user and the second user play the online game at a same time, and an asynchronous mode of play when the first user and the second user are not playing the online game at the same time; sending from the live interaction server to the game server information identifying if the first user and the second user are in synchronous mode; detecting, while in synchronous mode, a visit by the second user to the first game board and a request by the second user to place a game asset of the second user in the first game board of the first user; presenting, while in synchronous mode, to the first user in the first game board an option to approve the request; and installing the game asset in the first game board when the first user approves the request, wherein the second user obtains one or more game rewards when the first user interacts with the game asset while playing the online game, wherein operations of the method are executed by a processor.